Within dlalanathi there is a constant practice of reflection on our work in the community, learning about what is working and what is not working, the identification of areas to strengthen our work with children, youth and families and with this the constant response to design and develop new programmes. We are experts in designing creative, playful, psychosocial processes that engage participants in a meaningful personal experience in the moment and leaves them with something that they can implement immediately. We also know how to adapt our programmes to suite new contexts that serve the community and partnering organisations. In the field of research, we see ourselves as a preferred partner for government institutions and research organisations as what we do best is design workable, feasible, accessible programmes that can be transferred to others and brought to scale. We do not hold on to what we have but seek always to give it away in order to strengthen what others do. The first 3 years are the most significant period of brain development over the child’s lifespan and developmentally this is when children are cared for mostly at home. Home based caregiver driven stimulation and learning is the basis of all education and complements high quality education in centres. 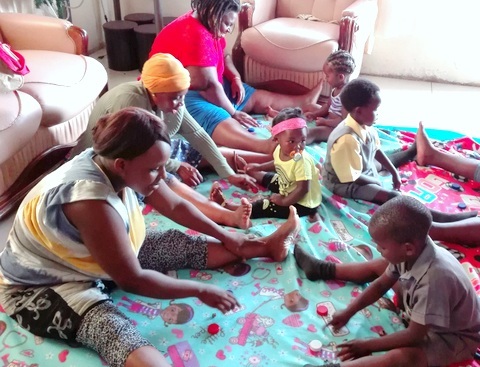 Establish home based, weekly neighbourhood play and learning groups for caregivers with children under 5 and enable caregiver groups to facilitate this learning play process independently as a group using the skills learnt to increase playful learning for their children when at home. This is a home base programme that places the skills in the hands of the caregiver increasing her capacity to play for learning with her children. It combines parenting principles with play for development, stimulation and learning. It combines group sessions with home visits to strengthen application for learning beyond the group session into the home. It addresses the challenge of ‘space to play’, by using a play-mat for group play sessions and play at home. The mat by its very nature defines a safe space for children to play. It places educational toys within the families reach by making toys with parents from recycled goods. Its sustainability is based on establishing a neighbourhood and caregiver driven household routine that intentionally invites children under 5 to play and learn. 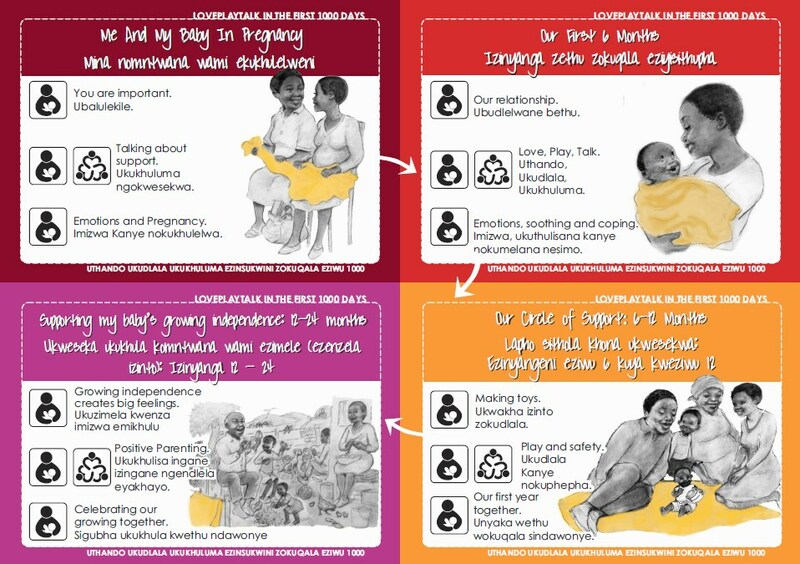 This home visiting programme is designed to be an add-on to existing home visiting programmes that are targeted at supporting mothers, families and children in the 1st 1000 Days of a child’s life. This means that what is covered in this programme is additional to home visiting programs which focus on danger signs in pregnancy, information about nutrition, health, weight, HIV and TB treatment in pregnancy. For a pregnant moms or moms of a young baby, going to the clinic is still extremely important. This programme does not cover information on any of the important aspects of pregnancy mentioned above, rather we are adding relationship interaction as an equally important focus. Love, Play, Talk and Strengthening Nurturing Relationships between mom, family and baby are the intentions in this program. LOVE: The baby is welcomed with warmth and care into a relationship with Mom and family. Love means that Mom ‘keeps baby in mind’, listens, responds and attends to baby’s needs gently as needed. Mom communicates love through her voice, touch, her gaze, and her attunement to her baby’s needs (hunger, tiredness, discomfort). Her care is communicated in direct response to communication from her baby. PLAY: This refers to moments of shared joy between Mom and her baby in which they are enjoying being in each other’s company. The interaction is equally positive for Mom and her baby. Play refers to actions Mom takes to invite her baby to interact that are not solely focused on the practical care tasks. This is about getting to know and experiencing baby as a person with likes and dislikes, feelings and characteristics that make this baby a special and unique person. TALK: This refers to verbalising, expressing, and communicating with baby using language. Language is vital in two ways. One, language is a core building block in the cognitive development of the baby’s young brain. Two, how language and tone is used also communicates the emotional context to the baby. The blanket is the central image through all the add-on materials. The blanket represents the sense of warmth and welcome of baby in preparation for birth and the love, care and support offered once born by Mom and her family. The blanket brings with it new messages through the journey of the 1st 1000 Days. The baby: In pregnancy, the introduction of the blanket helps mom and family to become more conscious of the baby’s impending arrival and to prepare emotionally for a new baby. Relationship: The blanket represents the relationship between mom and baby and all the care and love that is held in that relationship. Support: The home visitor is the ‘blanket of support’ for mom throughout the process.